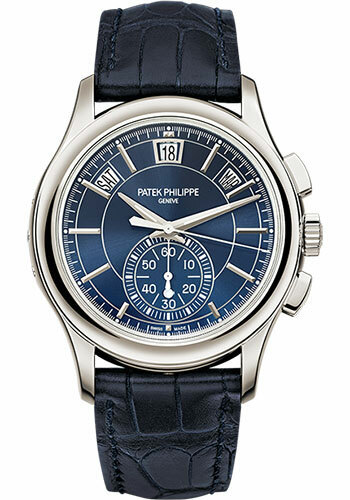 42 mm platinum case, sapphire-crystal back, blue sunburst dial with gold applied hour markers, caliber CH 28-520 QA 24H self-winding movement with Annual Calendar and Chronograph (sweep seconds hand (chronograph hand) and 60-minute counter, day, date, month in apertures, day/night indication), approximately 45-55 hours of power reserve, matt navy blue alligator strap with square scales, prong buckle. Water resistant to 30 m.
42 mm platinum case, sapphire-crystal back, ebony black sunburst dial with gold applied hour markers, caliber CH 28-520 QA 24H self-winding movement with Annual Calendar and Chronograph (sweep seconds hand (chronograph hand) and 60-minute counter, day, date, month in apertures, day/night indication), approximately 45-55 hours of power reserve, matt black alligator strap with square scales, prong buckle. Water resistant to 30 m.
40.5 mm stainless steel case, sapphire-crystal back, silvery opaline dial with blackened gold applied hour markers, caliber CH 28-520 IRM QA 24H self-winding movement with annual calendar, chronograph, 60-minute and 12-hour mono counter, apertures for day date and month, approximately 45-55 hours of power reserve, vintage brown calf leather strap, clevis prong buckle. Water resistant to 30 m.
40.5 mm stainless steel case, sapphire-crystal back, silvery opaline dial with blackened gold applied hour markers, caliber CH 28-520 IRM QA 24H self-winding movement with annual calendar, chronograph, 60-minute and 12-hour mono counter, apertures for day date and month, approximately 45-55 hours of power reserve, stainless steel bracelet, fold-over buckle. Water resistant to 30 m.
40.5 mm platinum case, sapphire-crystal back, bezel set with 35 baguette diamonds (~ 3.48 ct), matt blue dial with 8 diamond hour markers (~ 0.23 ct), caliber CH 28-520 QA 24H self-winding movement with Annual Calendar and Chronograph (sweep seconds hand (chronograph hand) and 60-minute counter, day, date, month in apertures, day/night indication), approximately 45-55 hours of power reserve, shiny navy blue alligator strap with square scales, fold-over buckle set with 22 baguette diamonds (~0.97 ct). Water resistant to 30 m.